If you haven’t heard Walter Strauss play, then you’ve never heard music like this before. This Californian guitarist’s songs are full of the groove and fire of a West African dance party, the dynamics and textures of a string orchestra, and the back-porch soul of American roots music. It’s out of this world music. Walter’s innovative guitar style layers on highly articulated melodies and harmonies, rhythms and counter-rhythms, giving the impression he is somehow playing several instruments at once. He blends his modern approach to the guitar with the ancient roots of global music traditions to create a truly singular style. Walter has “translated” music to guitar from the kora, the traditional 21-stringed harp of West Africa, and he integrates the tonal and rhythmic contours of instruments like the kamal’ngoni (a West African hunters harp) and the Indian sitar into his into his playing and compositions. 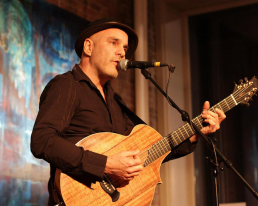 His songs soulfully trace forgotten histories and life’s paradoxes in the 21st century, and his guitar interpretations of far-flung global music are showstoppers. Walter has performed both solo and in collaborations throughout the US, UK, Ireland, and Canada, and in northern Europe and Mali, West Africa – at major venues and festivals like Kennedy Center, the Celtic Connections Festival in Scotland, and Le Diplomat in Bamako, Mali. His collaborations have spanned an impressive range of genres, from a duo with Grammy-winning Malian kora player Mamadou Diabate to American guitar maestro Alex de Grassi and Americana songsters The Burns Sisters.